– Mother of 2 boys aged 4 and 2. – I have a chronic disease. – I am also an amateur musician and enjoy gardening and photography. There are struggles with both aspects; and this makes me who I am and each side affects the other. My humanity often defines me as a person and a GP; I am known as someone who listens, takes people’s worries seriously, compassionate, puts others before myself (too much apparently! ), is ‘too’ honest (?!) and is, quite simply, normal (i.e. human) which seems to put people at ease and make them feel that they are understood. I started writing this blog in September 2017 as a result of being ‘broken;’ things felt overwhelming and chaotic yet empty. I was finding it difficult to talk, but easy to write. My first piece, ‘The Other Side’, has been widely shared and has now been read over 40,000 times; apparently it resonates with others. I continued to chart my journey and have had wonderful feedback from others; doctors feeling the same, other people with mental health struggles and relatives and friends of those who suffer. I am told I have put into words what others find hard to express and that it is helping to open up communication about the taboo subject of mental health; which, it seems, is particularly perceived as such in doctors. I have set up online support groups for GPs and Physicians (hosted on Facebook) which has provided a space for doctors to share their feelings and experiences and support each other. I have also created ‘Glos. Medics Meet’; a monthly meeting for local doctors to meet together for peer support. 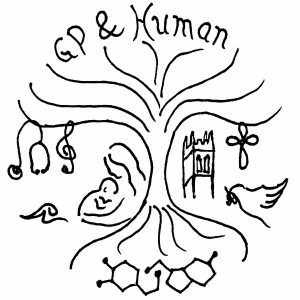 I am gradually developing the site more widely; other aspects of ‘GP and Humanity.’ I intend it to be a resource for anyone who has an interest in the subject matter. This will be through sharing links to established medical resources, non-medical information and obviously my blogs which are, of course, my own subjective thoughts and should only be viewed as such. My personal ‘journey’ is now kept more private for varying reasons but there are many things I feel I still would like to write about. I have had reason more recently to have an in-depth insight into Domestic Abuse. This has been a huge learning experience and the level of dishonesty, immorality and injustice that surrounds this has fired me up to do my bit to help victims and therefore I intend to use my blog as a platform to do this and hopefully, at some stage, become an advocate for Domestic Abuse victims in a more official and practical capacity. All opinions expressed are my own and do not reflect the views of anyone else, including my employer. I hope my blogs and writing will be helpful to others but it is not intended to replace individualised proper medical assessment and advice.